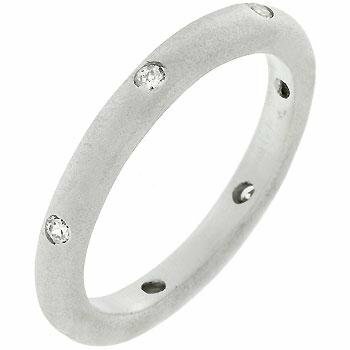 Feminine and subtle this eternity wedding band is a pleasuring mix of matte silver tone and handset cubic zirconia. Fit for a woman. Our genuine rhodium finish is achieved using an electroplating process that coats the item with heavy layers of rhodium -- a close cousin to platinum -- which gives our jewelry a platinum luster. Packaged in a gift box to ensure a smile on your loved ones face! If you have any questions about this product by Covet Jewelry, contact us by completing and submitting the form below. If you are looking for a specif part number, please include it with your message.